Yes I know, I was back like two weeks ago from Hong Kong, China, but this time I’m back from our cruise trip we had booked before our Hong Kong trip!! We took a Norwegian Bliss cruise out of Miami with stops in St. Thomas USVI, Tortola BVI (my personal favourite for the lovely views of rainforest and coast line, and one of the nicest beaches I’ve been to), and Bahamas. We did some amazing snorkeling right off the beach in Magens Bay, St Thomas. I was snorkeling with land developer Charles’ Wah’s dad, he goes by Wah, and my brother, Tony. My brother is an advanced diver, I’m a recreational diver. We both like to dive, but when travelling with kids, snorkeling will have to do. We saw lots of tropical fish (some the size of my forearm), a school of cuttlefish, and the highlight was an octopus. We hung out with our eight legged friend for a bit and were treated to a show as it changed colours to an almost-white. Snorkeling brought back memories of my brother and I snorkeling in Bahamas as kids. This event and the whole trip was a great bonding experience for us. On the trip was my wife and kids, Tony’s wife and kid, my mom, friends of the show Charles Wah, land developer, and Andy Tran, best known for his basement suite consulting business. They both brought their families, including parents. Our total group was 26 and it was so much fun!!! I call this having multiple flavours of cake and eating it too!! A couple real estate friends look to be coming too. How great is that, a motivational conference followed by a week with fellow entrepreneurs to mastermind and have a good time. I truly love mixing business with pleasure!!!! Quick announcement before we get to our guest, I’m still getting questions on almost a daily basis on timing real estate, the future of real estate, blockchain and real estate, am I worried about interest rates and bubbles, the recent announcement of the GM plant closing in Oshawa etc… so come January at my monthly networking meeting I will go over how I see the world and how the research drives my decisions. I am not an economist, however I am a multi millionaire investor, I’ve coached multiple multi millionaire investors, and I spend a lot of time around other real estate multi millionaires, so hopefully I’ve learnt something along the way. I’ll share the research so you may make your own decisions. So go to http://www.truthaboutrealestateinvesting.ca/meeting/ to get on the invite list. Our January guest speakers are currently developing a small piece of land and building two houses from scratch on a lot they bought, which already had two properties on it. Pretty cool eh? Take two properties and sever the lot, build for a total of four properties and 8 units. How did they do it? Andy Tran and Charles Wah will be at my networking meeting to share how they went about doing it. 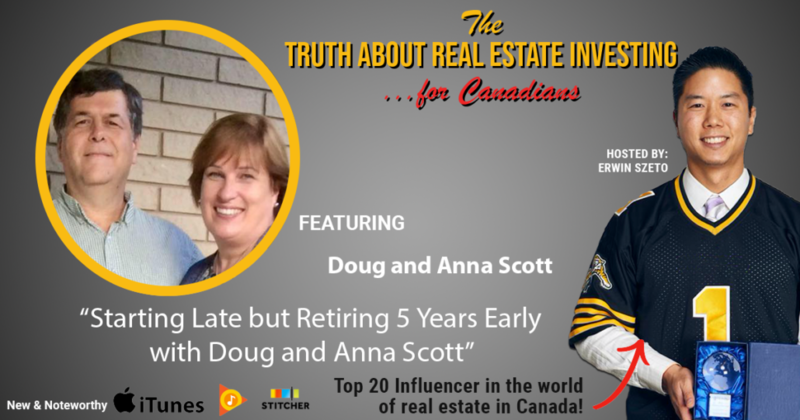 Have you met Doug and Anna Scott? No? They are at every networking event. They will even split up to divide and conquer if there are events going on at the same time. I last saw Doug at the Ontario Landlord Watch Annual Conference but no Anna, she was at Scott McGilvrey’s Keyspire event in Toronto where they are member coaches. Doug and Anna also host their own networking group in Cambridge, Ontario. I’ve been before, and it’s a great, energetic group of action takers. My wife has spoken there twice, and I spoke there just a few months ago. I highly recommend you check them out if you’re in the area… or not from the area, as Doug and Anna will tell you. No great event is too far, as they live in Waterloo but are regulars and members of the Durham REI meetings all the way in Whitby, Ontario. That’s 90 minutes in no traffic or five hours in Toronto traffic! Anyway, here is their story on how starting later in life and investing in just a few properties still allowed Doug to retire five years early, and how retirement/full time investing really means spending more time doing what they want to do. How they got started, how to be great networkers, and as always, advice for the new investor. How to Buy a Business with Ajay Jain The DOW plunged 800 points last Tuesday. How to Invest Like Mike?